In 1942, Bill Manbo and his family were forced from their Hollywood home into the Japanese American internment camp at Heart Mountain in Wyoming. While there, Manbo documented both the bleakness and beauty of his surroundings using Kodachrome film—a technology then just seven years old—to capture community celebrations and to record his family’s struggle to maintain a normal life under the harsh conditions of racial imprisonment. 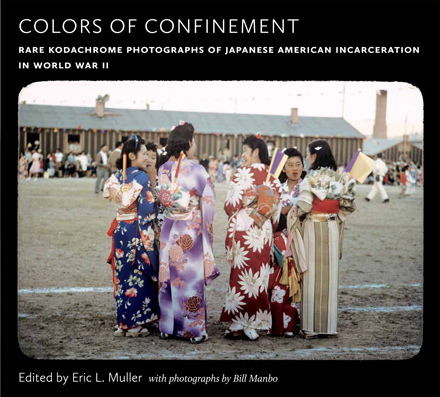 Colors of Confinement showcases sixty-five stunning images from this extremely rare collection of color photographs, presented along with three interpretive essays by leading scholars and a reflective, personal essay by a former Heart Mountain internee.